Being woken by the roar of a passing freight train while fast asleep under a billion stars in outback Australia would have to be one of the most surreal ways to ever awake. The location was alongside the Barrier Highway, in remote South Australia and around 150km south of Broken Hill. 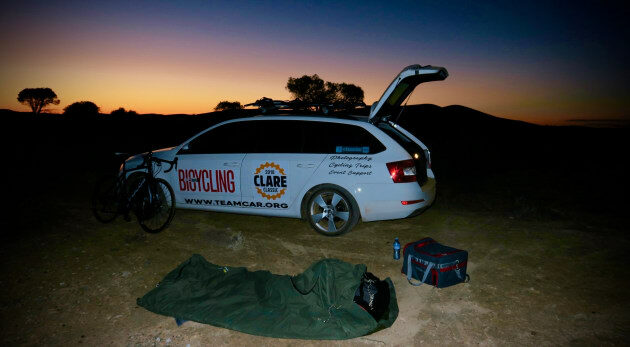 As around a kilometre of train thundered by, I sat bolt upright in the swag and momentarily wondered where on earth I was … the Milky Way above, moonlit rolling hills in the distance and the outline of a road bike leaning against my car just behind. Dawn on day two of the outback Paralane test. The bike, a Focus Paralane, was the main reason (read justification) for the trip - the all-rounder machine providing the perfect excuse to take the long way home from Adelaide to Sydney. 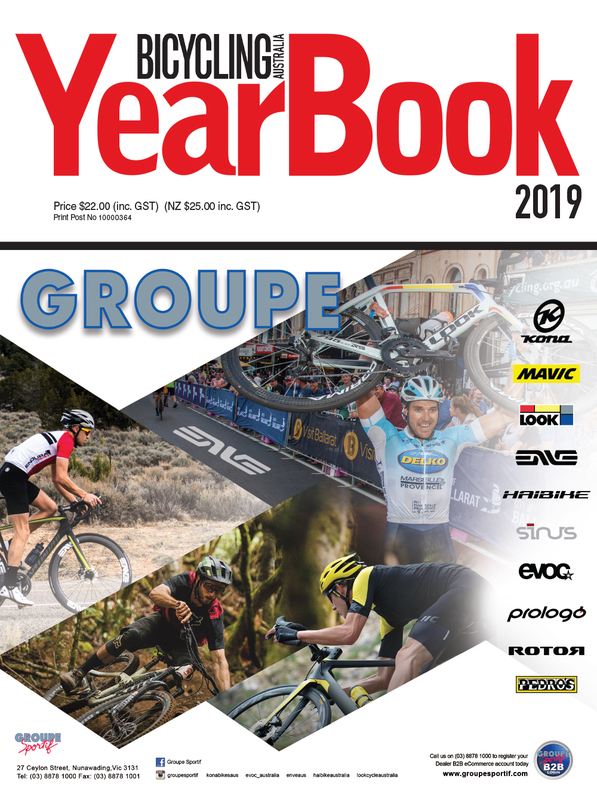 “Too many bike reviews are written from the comfort, sterility and security of an office,” I told ever-understanding former editor Gary Hunt. “I’d like to do this one in the Outback,” to which he fortunately obliged. Soon after sunrise next morning the Paralane was put through it’s paces. Designed, engineered and intended as an endurance bike, I turned the black test bike - finished with Shimano’s latest Ultegra groupset, hydraulic disc brakes, a Mavic disc wheelset and 32mm CX tyres - out onto the road. 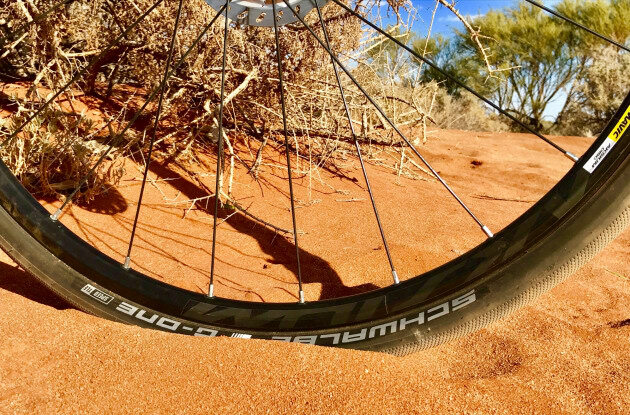 We fitted Schwalbe G-One 35mm tyres to the bike to combat the outback bulldust. The build felt at home on the gun-barrel straight Barrier Highway. Out of the box, and surprisingly (or coincidentally) not needing any saddle, bar or stem adjustments, this was a bike that immediately oozed comfort. An easy bike to ride, from the get go the Paralane felt an immensely capable, incredibly comfortable and ever-reliable all rounder. Blown sideways by a couple of passing roadtrains and around 15km south of the makeshift campsite, I pulled off the road onto one of the many sidetracks that accessed the main north/south rail line. The departure from blue black bitumen to rust brown bull dust felt relatively seamless - a lot easier than spotting the soft dust holes in the track ahead. The sparkling new gleam of the Focus Paralane lasted about half an hour with the powdery dust coving everything. Off road the Paralane felt equally comfortable. Extra effort was obviously required to push the bike over the softer sections of track, across the dirt and through the occasional gravel sectors, but overall the platform quickly proved itself as a capable steed. Acceleration was sprightly, the bike was well-balanced and relatively easy to control over the uneven surfaces and ups and downs of the monotonous dips and rises. Bike back on the car and secured into the Thule racks, we were again heading north. Stopping for roadhouse coffee at the tiny settlement of Yunta, I saw a sign to Arkaroola in the Flinders Ranges … just 192miles (or 301km) away. 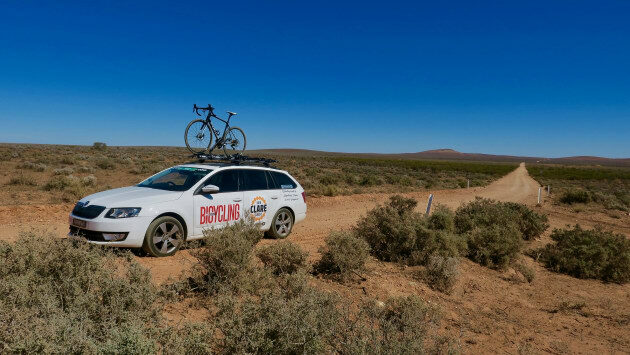 “How perfect the Paralane would be for that adventure,” I mused, while chatting to a friendly caravaner about the all-round road bike on the roof of the car. Later arriving at the historic ‘Silver City’ of Broken Hill, again the Paralane was down from the racks and ready to roll. Swapping out the tyres, I changed the 32mm knobby’s to a new pair of Schwalbe 35mm G-One road tyres - the fat slicks comfortably fitting within the Focus’s fork and frame. A proper road test was in order as I rolled out of the campground and put the bike through its paces on Broken Hill’s many short, sharp residential climbs. Despite its endurance geometry and design intention as an all-day, long-distance comfort machine, the Paralane exudes that familiar Focus feel - light in weight (a 905gr frame and overall build of 8.4kg in Ultegra Disc configuration with the 35mm Schwalbe tyres), a racy geometry, and all the characteristics of a performance bike. 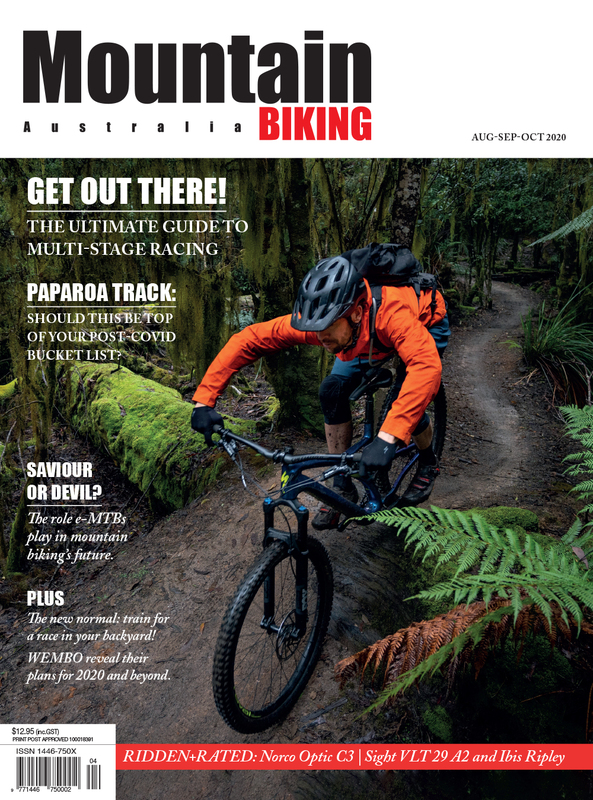 ‘A racing bike that’s ready for anything.’ That’s how Focus describe their Paralane and after a week in the outback I completely agree. 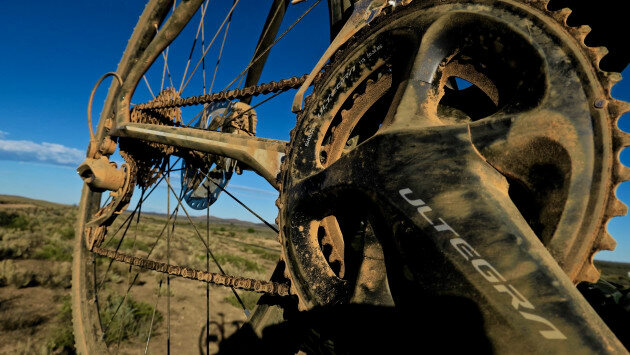 Want to set a PB up Broken Hill’s town mining memorial, blast along some outback single track such as the old Singleton rail line, join the Saturday morning bunch when back in Sydney … this bike will do it all with comfort, style and flair. Subtleties abound with this bike, the flattened top tube and curved, flat rear stays allow for compliance and comfort while retaining a race-ready and on-trend look. 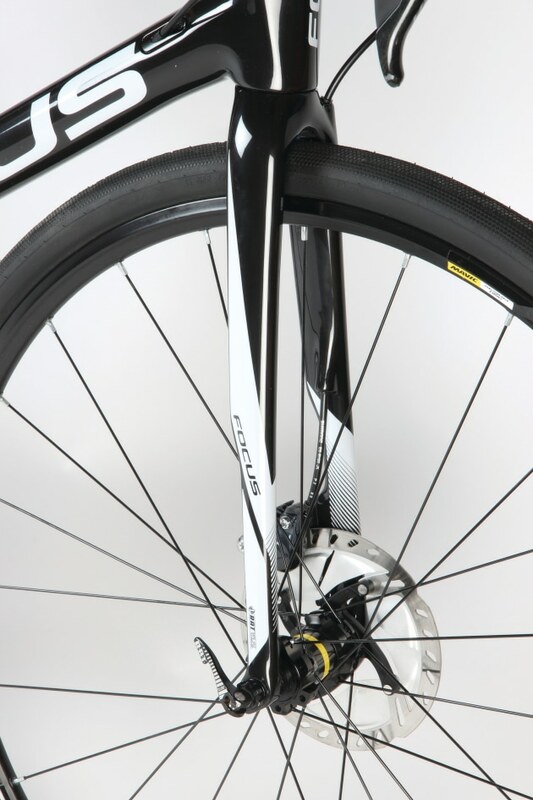 Then there’s the beefy head tube and cutaway fork carrying that compliance factor through to the front end. Midships you’re sitting on a factory fitted Prologo Kappa 3 saddle bolted to Focus’s unique cutaway seat post - a tear-shaped void designed to allow a certain degree of flex and extra comfort. 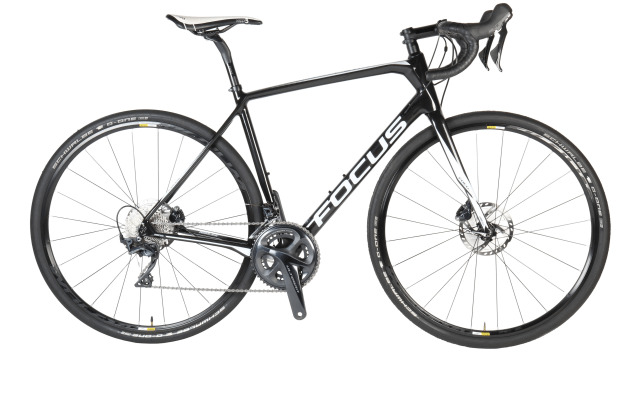 The bike features Focus’s ‘Rapid Axle Technology’ through axles - quarter turn quick releases designed for fast removal and hasty wheel changes. Cockpit wise the bike features a blacked out bar and stem - alloy 420mm bars with flat, aero inspired top, perfectly wrapped Focus bar tape and Shimano’s latest Ultegra levers treasuring in size and a perfect pairing. With an overall theme of black along with well-balanced touches of white (almost ‘Back To The Future’ style graphics on the down and top tube), I couldn’t help but think of another 80s movie while riding this cutting-edge allrounder on the dry and dusty roads around the Mad Max homelands of Silverton west of Broken Hill. 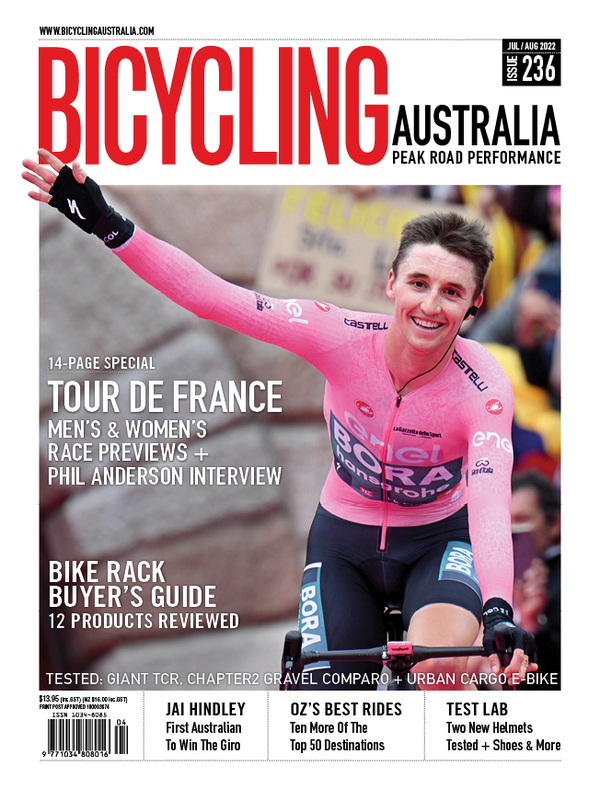 (For more on this watch the Outback Paralane videos on the Bicycling Australia YouTube channel). “It feels like the two-wheeled Interceptor,” I thought during an outback loop from the historic town out to Mundi Mundi lookout then on to long-dry local dam. Alone, under the sweltering sun and rich blue sky, returning to town with a slight tail wind, I couldn’t help but think the Focus Paralane was the ideal outback adventure seeker. Solid, secure and incredibly comfortable, this bike screamed compliance and capability. The ultimate test ground for an endurance all-rounder? The outback of Far Western New South Wales. Working through the gears on the climb back to Mundi Mundi - that same hill used in the scene of the fuel tanker rollover in Mad Max II - I couldn’t help but imagine the distant hum of the Interceptor, a gyrocopter above, and the Paralane playing a pivotal role in the day’s defence of the region’s roads and fuel supplies. Snapped into reality by yet another roo bounding across the road ahead, the bike lapped up those final country kilometres back to town. Unclipping the Kask and leaning the bike against the front wall of the Silverton Hotel, I couldn’t imagine a better road bike to explore outback Australia aboard. Focus continue to surprise with their lightweight frames, affordable price points, and standard inclusions. A great looking bike, well finished and quality German feel. Tested with 32mm CX tyres, then 35mm road tyres, across mixed surfaces from sand to dust to gravel to bitumen, the bike took it all in its stride. It felt as capable on short, sharp suburban climbs as it did on the gravel and single track. Quick off the mark, well geared, and the surety of Ultegra hydraulic disc brakes, the Paralane is a sprightly performer. 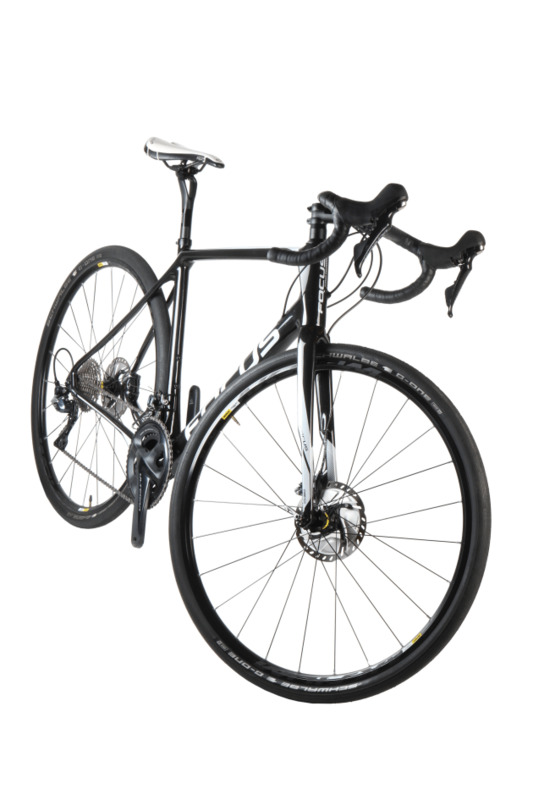 Starting from around $2500 with Shimano 105 disc and ranging through to $13,000 with SRAM Red eTap, but utilising the identical same frame, the Paralane platform offers an access point for all budgets and builds. Loved it. Fine German engineering, precise attention to detail, an affordable price point and genuine all day comfort— there’s a lot of bike for the buck here. The type of bike you’ll instantly bond with. Equally comfortable and as sure-footed on or off the road, it offers quality, reliability, great looks and is a lot of fun to ride. I didn't want to give it back. Frame: Focus Paralane Disc carbon. Internal brake and gear cable routing. Wheelset: Mavic Askium Disc, 17mm inner rim.